I’m a new member of my local guild and I attended a New Member Tea Party on Sunday. Actually I joined late last year sometime or maybe early this year. I can’t remember but this is the first New Member Tea Party they’ve had since I joined so I’m technically still a new member. I met a bunch of guild sisters and met some fellow newbies. It was fun and some things became clear as various board and committee members spoke about the different things the guild does. I’ve put my name on some lists and I hope that I will find something that I would like to get more involved in. There is also a new guild coming to town. The Modern Quilt Guild is getting a new chapter started here in the Valley. I’m a member of the Los Angeles Modern Quilt Guild and while the drive to Santa Monica/West LA isn’t horrendous, It is 30 minutes on the 405. Well, it was 30 minutes from my old house. It will probably be an hour now. I haven’t made the trek since we’ve moved and I’m not looking forward to it. But, the Valley chapter is going to have their first meeting at my favorite LQS, Quilt Emporium! That’s just 10 minutes from me now and 2 minutes from my office so I’m super excited about that group as well. The first meeting is next Monday. 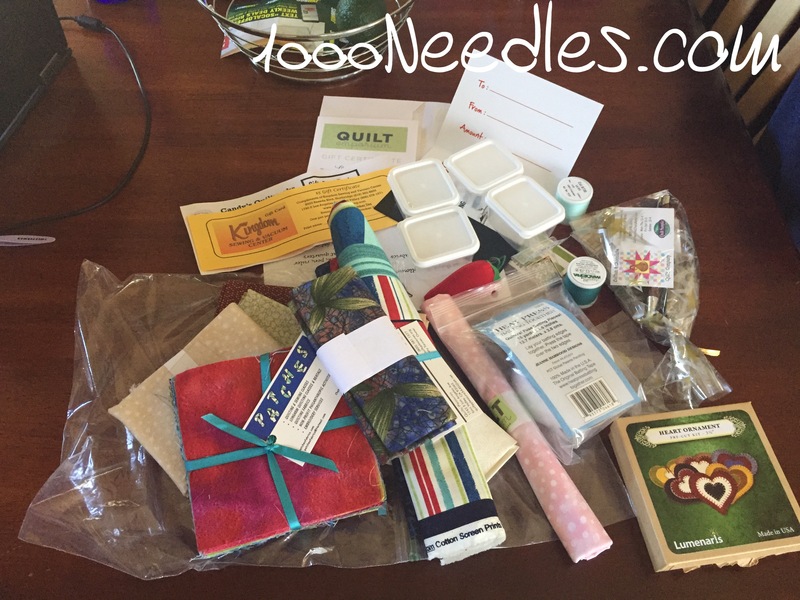 Anyway, I got loot – the membership committee went to local quilt shops and sewing machine shops who donated items for goodie bags for all the new members! Those papers at the top are gift certificates! I think there are 2 for local shops and there are 2 for sewing machine shops. 🙂 And I got fabric! I’m excited about the new guilds. There really are two traditional guilds (not that they all do traditional quilting). There is the day guild and the night guild. And from what I hear there are a lot of people who are members of both. Now the Valley Modern Quilt Guild that is starting up. I’m a member of the night guild since I cannot attend a lot of the day guild’s activities. I’m so grateful to have these guilds near me to be a member of. What a wonderful way to welcome new members! Fun! I haven’t taken the leap to join a guild yet. I’m sure it’s in my future however. Enjoy Melanie! Dori! I enjoy being a part of a guild because I don’t meet very many quilters so being a part of guild is really important to me. When my kids were younger I really couldn’t be a part of a guild. Now that they are older I can attend the meetings and be more involved. I love the idea of the New Member Tea and welcome bags. Which guild is that? Quilt Emporium is a lovely place, with lots of wonderful fabrics! Cotton & Chocolates will always be my favorite LA-area store, but there are so many lovely ones, I couldn’t complain about any of them! How exciting that you will have a Modern guild so close to you. The guild is the San Fernando Valley Quilt Association. I’m part of the night guild.